Scheduling your life will not only make you more productive, but it will allow you to know what you should be doing each moment of the day. You need to schedule your work time as well as your downtime. You should even create a schedule for checking social media. This will allow you to stay engaged without utilizing time from other tasks. Plan to get at least eight hours of sleep a night. “When you have enough rest, your mind is refreshed,” says Liew-Chng. 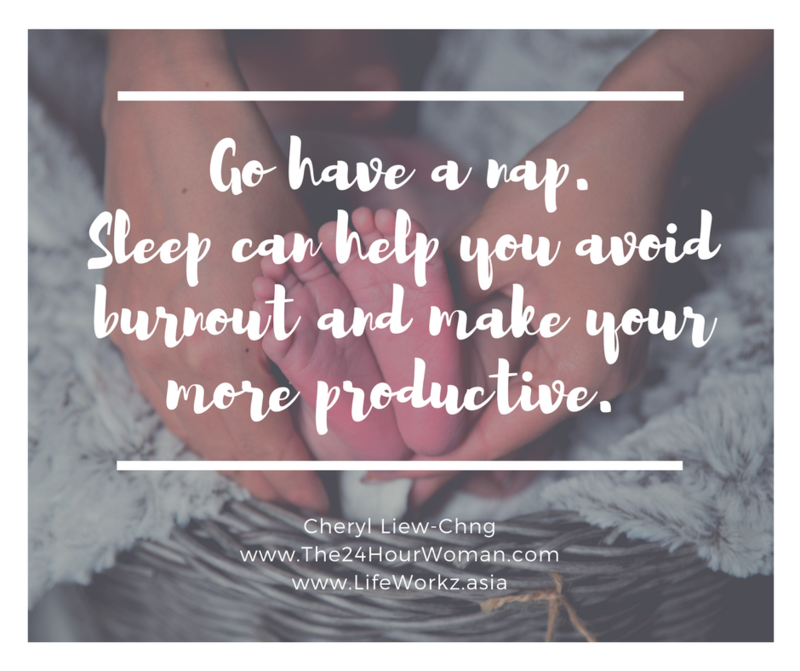 “You are more productive and able to focus.” Your body needs rest and if you can’t fit a full eight hours into your schedule, try slipping in some catnaps to help energize you and give you the sleep that you need. Your mind needs a break from work, and by focusing on other people or other activities, you will get a rest from your hectic schedule. Liew-Chng suggests, “Developing a habit where you spend time on a hobby.” Choose an activity that you enjoy and look forward to doing. It can be anything from crocheting to reading and woodworking. When work overloads you, you need to ask for help. Set up a team to provide you support and take on some of your duties. By creating systems and processes for your job, you will be able to delegate with ease, knowing that everything is being handled to your requirements. You need to ask for help to avoid burnout, so you don’t become overwhelmed whether it be at home or in the office. 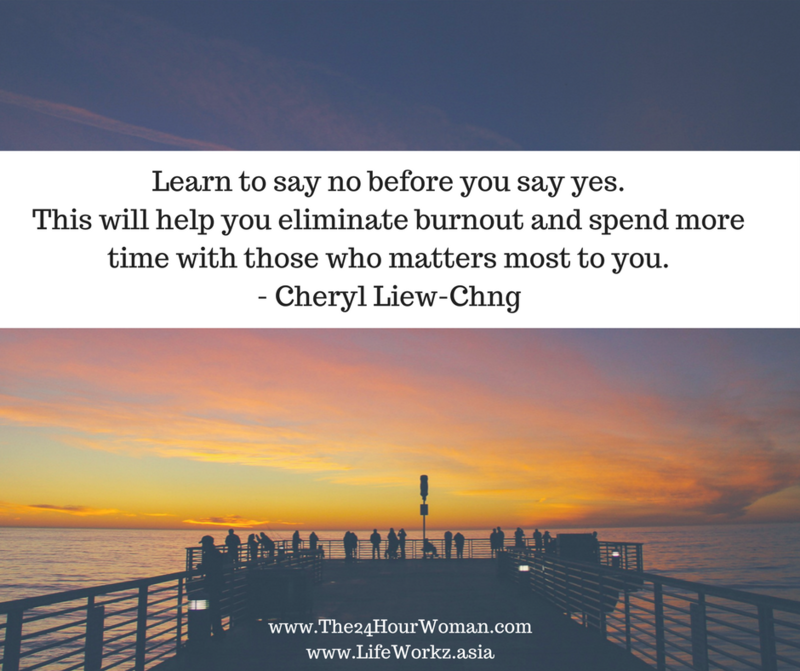 Learning to say no is an important part of managing your time. “Evaluate what is your business case is to say yes,” says Liew-Chng. Saying no can allow you to spend more time with your family and make a bigger impact in your community. It will also help you overcome burnout as you won’t be committed to tasks that aren’t important to you. Heeding this advice can help you avoid the potential for burnout in your life. You need to take immediate action so that you can move forward with your aspirations and eliminate any threats to your mental and physical wellbeing. Subscribe to my weekly newsletter at www.The24HourWoman.com to keep you up to date with my books and events and alert you when I’m in your area speaking or visiting. Like this episode? Then please share it! My blog, videos and podcast (upcoming) are ad-free ONLY because you share my work! Hey there, Cheryl here and welcome to today’s episode. Have you ever had an occasion where you felt a sense of panic attack or anxiety and you feel that there’s just so many things that’s running and you don’t think that you can ever get to all of them? Have you ever felt that over the long haul, you’ve been running a treadmill and there doesn’t seem to be an end to it and you feel that I’m so tired, I feel so sluggish and I just think that I’m just drowning in the amount of work that I have to do? Perhaps you feel at the end of the day, have I just wasted my day? I feel that my energy is not up there and I’m just not getting to it. Welcome to today’s episode, because I’m going to be sharing with you on how you can overcome burnout. How can you take back control of the day so that you’re productive, your energy is up and you don’t feel like you’re drowning, you don’t feel like you have wasted the day, and why is this important? Because I believe there’s something important that you want to establish, you want to be achieving in your day and in your life. Burnout is one of those that will stop us in our track in terms of achieving our aspiration and our ambition and that’s why I want to be working with you today and share with you what are five things, yes I have five. You see five cards I’ve prepared today. Five things that we can begin today to do something about it so that we stop burnout in the track and turn it around. This is important because if we don’t do anything, we will go into a downward spiral and it will feel as if we are in a hole that we cannot climb out. Therefore, this is why I wanted to just deal with this right now with regards to burnout so that we can step out and be able to go for our goals once again without feeling like we are running on a treadmill, without feeling as if there’s no end to it. We’re not feeling as if we’re drowning. Let’s get to it, what’s the very first step? Yes, schedule. You’ve heard me probably talk about this many, many, many times but scheduling helps in a couple of ways to take back control of the day and stop burnout. One, schedule, you know exactly what’s happening so that your mind focuses on one thing at a time. One of the things about burnout is because we put everything in our mind and we don’t schedule it out. Our mind tells us that, oh my gosh, there’s still so much work to do, there’s still so much to do. We build up within ourselves a sense of hurry, a sense of urgency where actually if we were to schedule it, we know exactly when, we can do all the things that we need to do and we actually have time to get that done and focus on that one thing that’s necessary. Second thing about scheduling is that when you have blocked time for your work, you should also have blocked time for your relaxation. When you have relaxation, you decompress, you have time to refresh yourself, renew yourself, you don’t feel that you’re on a treadmill, you’re running, running doing work, drowning in it all the time because there’s your downtime. The other thing about scheduling is that it fits a rhythm, particularly you know that okay, midday, this is what I’m going to do, in the afternoon this is what I’m going to do. There is a rhythm to your day so that you don’t go haphazard through the day and feel that at the end of the day, I didn’t really hit what I wanted to do today, but there’s a bit of rhythm throughout your day. The other thing about setting a schedule is that you can schedule social and by that I mean your social media platforms. You don’t feel that you’re left out because you’re not on social all the time because you have scheduled social so that you are on it. You know what’s happening and yet there’s times when you’re off it and be able to focus on what’s needed to be done so that you know that the pieces is moving. When you have the momentum, you will have better control of what’s happening and burnout will begin to get away from you because you know that these things are in place. You have time to do all that is needed. Let’s look at what’s the second thing that you can do right now. What’s the second thing that you can do? Second thing you can do is yes, get more sleep. Get more sleep and that’s important why? Because when you have enough rest, your mind is refreshed, you have higher productivity and you’re able to focus. When you’re able to focus you know that your movement, you are getting things done. When you have enough rest you know you are more productive and is more positive. Try this out. Go without sleep for a period of time. You feel it. You’re snappy, you’re not as able to focus as much and when you’re snappy, etc, it’s again, once again a downward spiral. You feel that you are, you are not getting anywhere and you are just making everyone around you unhappy and you are yourself unhappy, so have more sleep. By that I’m not saying, “Try to get more sleep.” I’m saying prioritise. That’s your number one priority right now to overcome burnout. Get more sleep. Get at least eight hours of sleep. When you’re rested you are able to bounce back, and when you bounce back, there’s no burnout, right? Get more sleep. Prioritise eight hours a day and then, oh, if you are not able to have eight hours straight in a row as you progress towards it you can build some cat naps. There are some days where some of my students and I, we are not able to build in eight hours of sleep, but in between, in the afternoons, etc, we take a cat nap and we catch up so that we do get in eight hours of rest. As you progress towards, wherever you are right now towards eight hours, build in a cat nap if you are not able to hit eight hours immediately, but prioritise heading to eight hours. In the meantime, build in cat naps so that you are able to make up to the eight hours. What’s the third thing? The third thing you can do is something else besides work. Yes, focus your mind on something else. Dwell away from your work on yourself. Start focusing on yourself, dwell on other people: your children or teammates, loved ones, or simply develop a habit where you go and spend time on your hobby. If there are no hobbies right now, go get a hobby, because one of things about people who do hate the words burnout is because they are so focused on just one thing, and that one thing all the time. They are drowning in that one thing. Go get a hobby, be that dancing, be that knitting, be that doing jigsaw puzzles or label, right? You get to do something that you like to do. Develop a hobby. Again, schedule time to go and do something else. Spend time with someone else to help you to, again, move your mind, move your focus, and get back control to living life fully once again. Now help can come in many, many forms. One of the best ways as I learn it and I learn from one of my mentors, built by Business by Design, is you have systems in place, and that I can tell you works wonders. Burnout was something that I personally experienced some years back and I realised one of the things is I was scaling my business, but all the processes was in my head. I didn’t have a systems in place. I didn’t have systems in place; I didn’t have processes in place. One of the things that you can do to begin to take back control and free your mind is to build systems. In first place to build systems you need to be able to build your processes. Right now, whatever you’re going to do next, make sure you document the process. In documenting the process you are then able to say, “Okay, the next time when I do this I’m going to hand it off to somebody else,” but first of all you need to be able to document that process, because when you document that you build it into a system. You give it to someone else. If you don’t give it to someone else, you can automate it using technology. That does wonders. Instead of sending and email broadcast every single time you basically automate the emails in a series. That helps because you don’t have to have to be there. You don’t have to focus. It doesn’t have to be a task that you do again, and again, and again. The other thing about asking for help and support is enlist others. Get a team together. If you’re not up to having a team yet, get your children or your family members. Get someone else to help in things that is not core, that you don’t really need to be doing it. One of the things about burnout is we feel that we need to do everything ourselves. Ask yourself again, “Do I really need to do this, and is there someone else that can be doing it instead?” Maybe there’s someone else, actually would do a better job than you do. All right, so that’s the fourth thing you can do to eliminate burnout. The final thing is say no. I’ve said this many, many times, and I’ll say it again. Say no before you say yes, unless, for example, at different seasons in life. For example you are just off from school and stepping into the workplace. You want to do as much because you want to be learning. You have energies to do so. Go ahead, but again, still give yourself a timeline as to when you would say no before you say yes. Find a way to evaluate. I find that one of the best ways for me to deal with this is to say no first and then in all before I say, give a response, I evaluate, what is the business case for me to say yes? The business case can include personal parameters, like, “Would it take time away from my family?” When you find that you are engaged in life more fully than just work, or you’re engaged in life more fully than just doing a lot of things, you are engaged with life, with people, with your loved ones, with what is meaningful with your community, you’ll find that you will manage burnout by asking yourself, “What’s the business case?” Because burnout sometimes happens because we do a lot of good things, a lot of wonderful things, but it takes us, it robs us away from the joy that we have with our loved ones. It robs us away from having the fulfilment of a good job done. It robs us away from the impact that we want to have with our community. There you have it. These are five ways that you can begin right now to overcome burnout. The very first one we said was schedule. The second was to sleep more. The third is to focus on something else. The fourth is to say, get some support, whether it’s systems, whether it’s people, and the final thing is to say no. Put that into action right away. Come on over to the blog and share with me which ones are you going to start doing right now and which ones are giving you the first results of pulling away from burnout and getting back the vibrancy in your life. My name is Cheryl and I look forward to seeing you in the next episode.